Sold by Tactideals and Fulfilled by Amazon. Sold by Tactideals and ships from Amazon Fulfillment. Sold by Heathtrade and ships from Amazon Fulfillment. 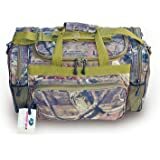 E-Z Tote 30" Real Tree Print Hunting Duffel Bag in 5 Colors-Best Sell Item- Best Gift!! 5.0 out of 5 starsGreat Range Bag! I love this bag! It is constructed well, it’ll last for years! Took it to the gun range w 4 hand guns (9mm Ruger, 40 Ruger, 44 Dan Wesson, & .38 special Smith & Wesson) w at least 200 rounds for each gun, 3 pairs of ear protection. Carried the bag w should strap & it held the weight well, still had plenty of space for additional items. We used one of the side pockets for gathered brass for future reloading. It is a good bag. My dad was so impressed I ordered a second for him in olive camo for him to use as his range bag. 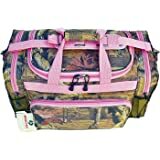 Ladies, if you want a touch of feminine color, or just love camo & like pink like me, the pink is a good option...but I would honestly recommend this bag to any person who needs to pack it w weight & go out shooting! 5.0 out of 5 starsRoomy and perfect for a weekend trip. I purchased this bag to be an overnight bag. 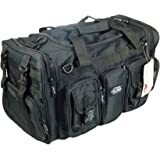 It is the perfect size for a few pairs of clothes and even a couple of pairs of shoes. Sturdy construction. Durable. Love it. This is a great bag. I have used it for many weekends out of town. It fits all of my items and I still have room to fit more if I choose to get things for family. The compartments are great and make it easy to organize everything I am taking. Not too big and not too small!! 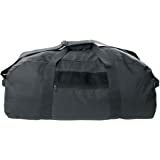 Nice size duffle bag. Fits all of my clothes and other essentials and it's still small enough that I can carry it. 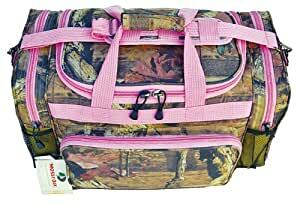 Love that Mossy Oak print with pink trim too. I've seen a lot of complaints about the term "luggage set". 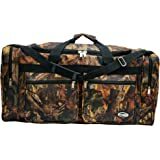 This is only one duffle, but there's a smaller one, sold depreciating, but they are a perfect match. I now own both. 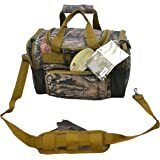 The bag is amazing, there are lots of pockets to keep things organized. It's very sturdy and even the zippers are sturdy. Sometimes you get a bag and you can tell the moment you open it the first time it won't last you long. You don't get that with this bag. And it looks exactly like the picture. So happy with this new bag. this bag is awesome! its spacious, durable, cute, and organized. 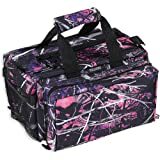 im using it as a gym bag, and will use it as a travel bag as well. very pleased! 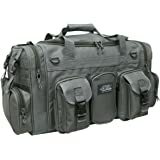 Love this bag, it is made really good and isn't cheaply made like I expected it to be. It great to take camping or anywhere. It is very roomy and the colors are pretty! The straps are sturdy as well! Will definitely be purchasing more in the future! Love them bags once I recived it the first one was lost in transit ! Now that I have recived the bags I love it but I think the shoulder strap could of been thicker and more derable it's hard to cary because keeps twisting up and it's hard to keep on shoulder!